Greg Kirsch is a partner in the Intellectual Property (IP) Department of Ballard Spahr LLP, a national law firm with 13 offices nationwide. 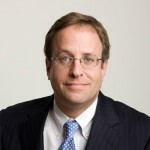 Greg leads the firm’s computer, electronics and communications technology patent team, and his legal practice focuses on patent procurement and portfolio management, client counseling, IP opinions, IP due diligence, licensing and IP litigation, for companies of all sizes and universities. In addition to his full-time legal practice, Greg serves as an adjunct professor of patent and intellectual property law at both Emory University School of Law in Atlanta and Washington University School of Law in St. Louis. Greg is a frequent speaker and author on the topic of IP and patents, and he holds a B.S. in Electrical and Computer Engineering, in addition to his law degree.